Congratulations to the Winning Bidder! 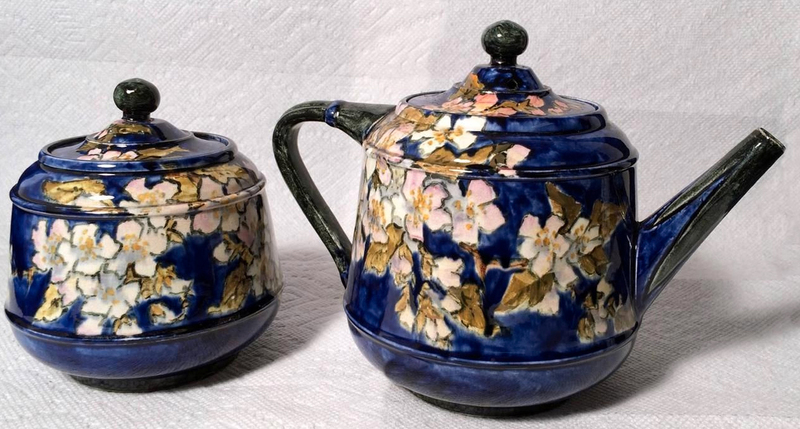 Congratulations to the winning bidder of the teapot and sugar bowl on ebay.com! After 30 bids the bidding concluded at at $1,950.00! Considering they won 2 John Bennett pieces, that was a bargain! They also now own something no other Bennett collector has (that I know of), a teapot and sugar bowl! When I scour the net for John Bennett pottery, The term I use most is “John Bennett vase”. I have an order of search terms: John Bennett: vase; pottery; charger; plaque; chalice; jardiniere; lamp; tile; art tile; watercolor; bowl; pitcher; ewer and sketch. Now I will add the terms teapot and sugar bowl! Again, congratulations! Tea Time with John Bennett on EBAY! I was very excited to come across this on ebay as it is the only teapot and sugar bowl I’ve ever seen from John Bennett! They are extraordinary and would certainly start a conversation when serving guest in your home or gallery! One lump or two? I’m sure a John Bennett collector, family member or museum will be thrilled to have it in their collection. They are stunning! This lot will conclude tomorrow, Sunday, January 11, 2015 at 9:22 pm. I apologize for the late notice. I just came across it last night. On the site the lot is referred to sometimes as a “teapot and creamer”. This is an easy-to-make mistake. It’s clearly a teapot and sugar bowl and there isn’t a creamer. The description has it correct but some of the titles have the mistake. It would be great to get a picture of the teapot and sugar bowl in its new home! Good luck with the bidding! NO RESERVE! Fresh from an estate on Bangor, Maine. The sugar bowl measures 6″ tall and 5″ at its widest diameter. The teapot also measures 8.25″ at its widest overall point (spout to outside edge of its handle) while the sugar bowl measures 5″ tall and 4.5″ at its widest diameter. The set is being sold on ebay.com by seller “ryanjordan71”. “ryanjordan71” is the ebay.com arm of Gould Auctions, from Smithfield, Maine. The owner, Tim Gould was kind to share his images with us. I don’t believe these areas should effect the price much. All of the large images are linked to this sale and the links will probably quit working soon after the bidding concludes. I inserted a gallery near the bottom which isn’t. I do not have the rights to any of the images used in this article. The images of the pottery were shared for this article. Special thanks to Tim Gould for sharing the images, ebay and Gould Auctions in Smithfield, Maine. The Met Scores a Perfect 10! 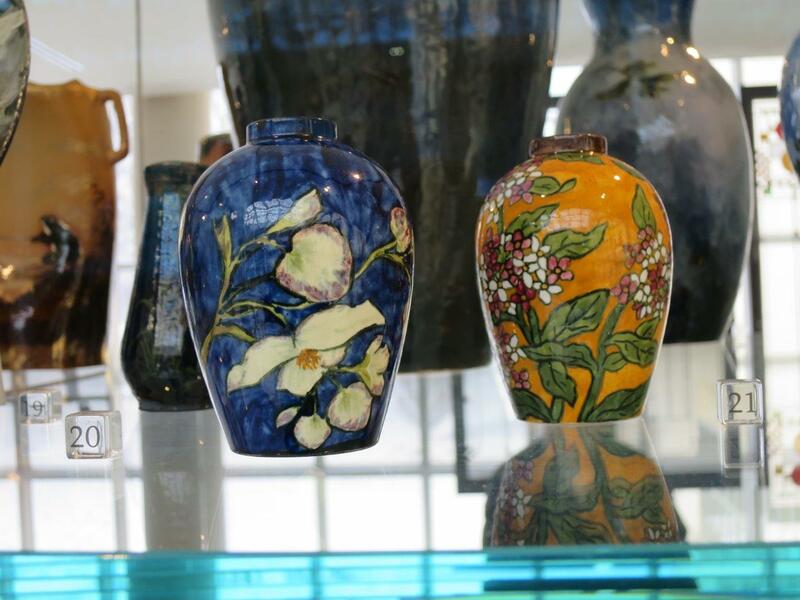 The Metropolitan Museum of Art in New York is home to an impressive collection of John Bennett pottery. In the past I have I’ve discussed eight pieces in their collection that I was aware of. I would like to thank to New York collectors Robert Tuggle and Paul Jeromack for sending me photos and bringing to my attention 2 additional John Bennett vases! 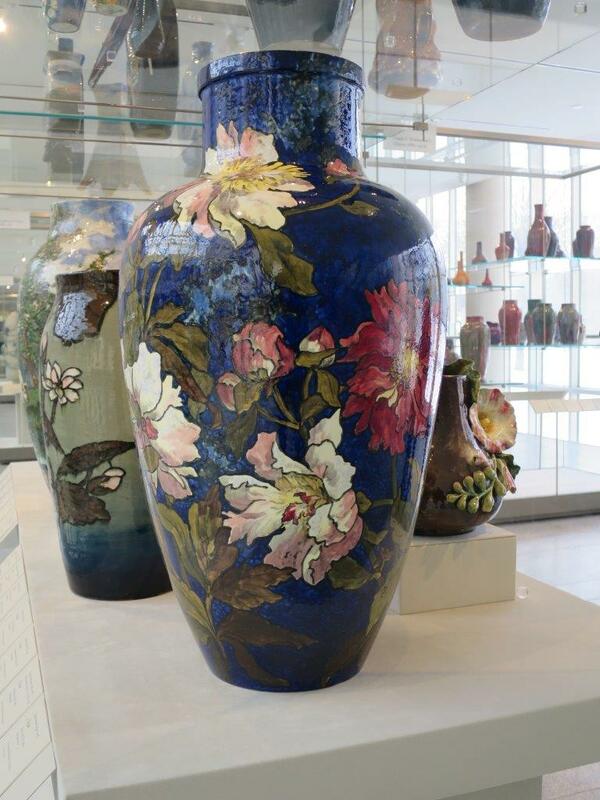 The two vases are part of the Robert A. Ellison Jr. Collection, displayed in the American Wing. 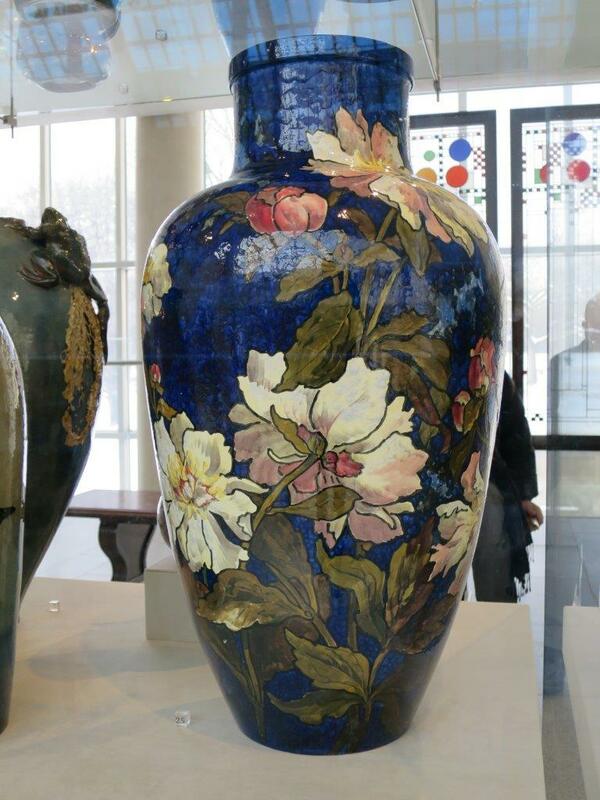 I knew of the beautiful blue vase (25 1/2″ h) from the same collection. The large blue vase is juxtaposed with two petite Bennett vases on the shelf above it. Both small pieces are typical for John Bennett in the way the painting is applied. The surprise to me was the scale of the pieces! Displayed with the stunning and larger blue Bennett, it showcases the range in scale in which John Bennett worked. The contrast in size makes the display more interesting than just beautiful pottery. The Robert A. Ellison Jr. Collection of Ceramics at the Metropolitan Museum of Art showcases the collection of artistic ceramics in the United States from 1876 to 1956. The earliest examples date to the Centennial Exhibition in Philadelphia in 1876. The Centennial Exhibition was the first time John Bennett’s work would be displayed in the United States. At the time he was with H. Doulton & Company. The works are displayed in the Mezzanine Gallery 707 of the American Wing. Gallery 707 is one of 73 galleries in the American Wing. The American Wing houses 17,194 examples of American Decorative Arts. More information about the American Wing at the Metropolitan Museum of Art can be found here. Promised Gift of Robert A. Ellison Jr.
L.2009.22.50. Photograph Robert A. Ellison Jr.
A wonderful video with collector Robert A. Ellison Jr. and Alice Cooney Frelinghuysen, the Metropolitan Museum’s Anthony W. and Lulu C. Wang Curator of American Decorative Arts, discussing his gifted collection of American ceramics from 1876 to 1956 can be seen here or by clicking the image below (Almost 4.5 minutes. I’m not sure how long this link will last). I do not have rights to any of the images or video in this article. Images used belong to The Metropolitan Museum of Art, Robert Tuggle and Paul Jeromack and the You Tube video was produced by Gruvelocity. I try to maintain links from images used to their respective owners. Thank you Metropolitan Museum of Art, Robert Tuggle and Paul Jeromack and Gruvelocity. I encourage everyone to visit and support the Metropolitan Museum of Art. Fee includes admission to the Main Building and same-week admission to The Cloisters museum and gardens. There is no extra charge for entrance to exhibitions. For more information about the Met, please visit www.metmuseum.org. How cool is this? Now you can take the Met with you. The Met App can be downloaded for free from the App Store. For more information click on the image below. Available exclusively on iPhone, iPod Touch, and iPad. 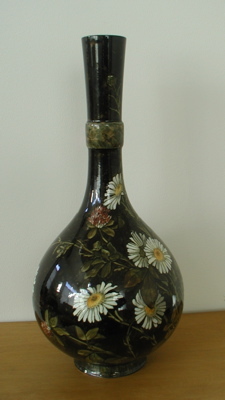 This evening a charming John Bennett vase sold on ebay.com. Flying under the radar the bidding was quiet until just before closing when it it rose to when it rose from $99 to $1,475! I’m sure the lucky buyer will be happy with this beautiful vase. I believe the price to be modest in comparison to other Bennett pieces that have sold that were similar. The body of the vase is classical but simple. Congratulations to the new owner! John Bennett Vase at Auction… TODAY! 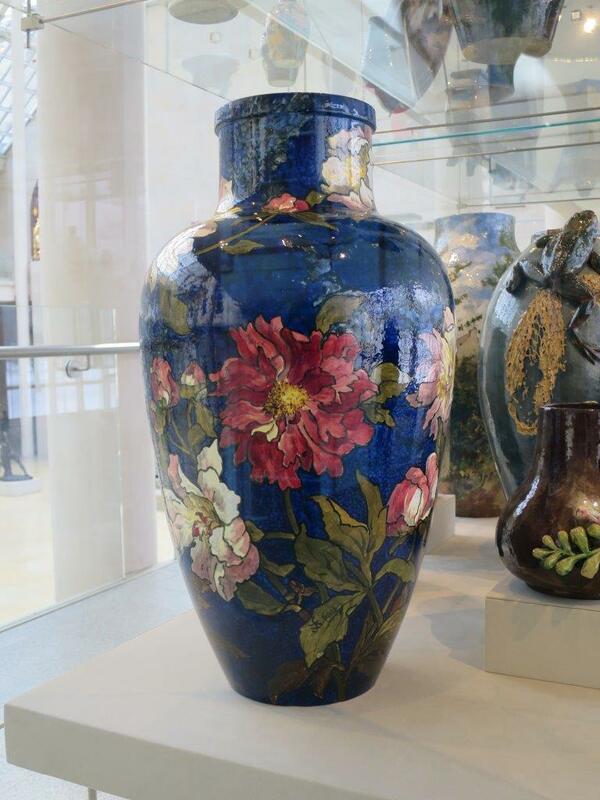 I just came across a beautiful John Bennett vase which is at auction today! If you’re interested, I hope it’s not too late. Cowan’s Auctions, Inc. (formerly Cowan’s Historic Americana) is one of the nation’s leaders in the sale of Historic Americana, American & European Furniture, Decorative Arts, and American Indian Arts. Cowan’s Auctions is owned and operated by Wes Cowan, an internationally recognized expert in historic Americana, Wes stars in the PBS television series History Detectives and is a featured appraiser on Antiques Roadshow. He writes an antiques column for the Cincinnati Enquirer and is a frequently requested speaker at antiques events around the country. Wes is licensed as an auctioneer in Ohio and holds a BA and MA in anthropology from the University of Kentucky, and a PhD in anthropology from the University of Michigan. A tall bottle vase rising above a round foot with a bulbous body and slender neck, having all-over white and green floral decoration against a dark blue ground, signed on underside in blue J Bennett / ? (obscured when drilled through)? / N.Y., below marks in black 6 MC (monogram) 79; ht. 15.25 in. Condition: Vase was previously drilled as a lamp, obscuring the address line of Bennett’s signature. The monogram stated by Cowan’s Auctions is actually a conjoined M,A,C,E. It was from John Bennett’s assistant, Mary Adaline Edwards Carter. Her services were later secured by Louis Tiffany and she was a very accomplished decorative artist. I wrote about her back in February, 2012. The article, “Mystery Initials” can be found here. While I was confirming this I saw another John Bennett vase (previously pulled from auction) coming back in a week at Rago Arts Auction Center. The Early 20th Century Design Auction begins at 8 AM, October 18, 2014. The catalog can be viewed here. Perhaps if we’re too late to bid today we can bid next week! Good luck! Special thanks to Cowan’s Auctions, Live Auctioneers and Rago Arts Auction Center. A John Bennett art tile is currently listed on ebay. It is listed on ebay here. The tile is connected to a published set I wrote about a couple of years ago. That article is archived here. The Quixote art tiles above appear in the book. Below are pictures the seller has posted on ebay. I have linked all the pictures to the page on ebay. When the auctions ends the links may not still work. It’s very rare to find John Bennett art tiles. I was happy to see this one! The tile is a large 7 7/8″ square, unlike the tiles in my collection which are 6″. It also uses letters in the background, just like the tiles in the book. As the the Delftware like blue sketch is on a white background, it does show some browning, crazing and minor chips. Perhaps we don’t see this often in his other works because of his intense use of color and decoration. 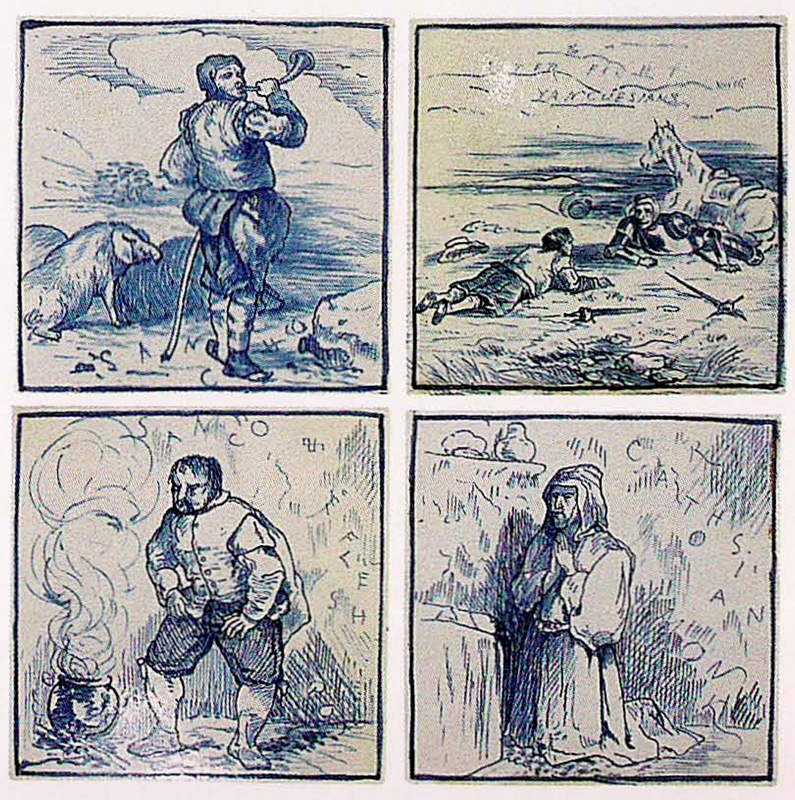 The tiles from this series, a departure from his typical style are simple sketches and are mysterious with the letters in the background. Of the series of Quixote tiles, I really like this one because the two main characters, Don Quixote and his squire Sancho Panza appear on the same tile. The auction ends in a couple of days (May 29, 2014 ). Good luck!